NEW YORK — In another life, ex-cop Max Payne might have been an acrobat. A depressed, alcoholic, trigger-happy acrobat with a gift for gratuitous violence. You’ll see his gymnastic talents in Max Payne 3 , which developer Rockstar Games will release for Xbox 360, PlayStation 3 and PC in March. By temporarily triggering his trademark “bullet time” and slowing his enemies’ gunfire to a crawl, Payne can flip, twist and lunge his way through the streets and warehouses of Brazil, dispatching criminals en passant. He’d make a good addition to Barnum & Bailey if he weren’t so addicted to painkillers. Though I didn’t get to play the third-person shooter when I went to Rockstar’s Manhattan offices on Wednesday, company reps showed me several of the game’s chaotic levels, which are filled with the type of slow-motion slaughter that Max Payne is known for. In addition to bullet time, other returning series staples include internal monologues (voiced once again by the talented James McCaffrey) and story scenes that look like pages from a graphic novel. This is the first Max Payne game developed entirely in-house at Rockstar. The previous two were designed by Finnish studio Remedy Entertainment, which has since moved on to Alan Wake . Rockstar has the unenviable task of improving on Max Payne ’s action-packed formula while staying true to the series’ roots. “We’re keeping the core fundamentals, but we’re making what we think Max Payne should be in 2011,” said a company representative. In 2011, Max Payne is living and working in São Paulo, Brazil, where he’s found a job protecting the children of a wealthy family. Haunted by ghosts from his past (and the events of the first two games), he’s hitting the booze and pills hard. When a member of the family is kidnapped by a gang, Payne finds himself swept up in a series of violent schemes involving various Brazilian criminals and paramilitary groups. Max Payne 3 has some new bells and whistles, like an optional cover system and the fancy Euphoria character animation engine, last seen in Grand Theft Auto IV and Red Dead Redemption , but the game still revolves around moving and shooting. You can hold up to three weapons at once and wield two at a time. Payne’s health won’t regenerate automatically, so restorative painkillers will be your new best friend. The first part of the demo took place in New Jersey. A mobster and his goons arrived at Payne’s squalid Hoboken apartment, calling for the ex-cop’s head. Payne had killed the mobster’s only son, which turned out to be a bit of a faux pas. So the mobster sent his squad to take revenge, leaving Payne no choice but to fight his way out. We also meet Raul Passos, an acquaintance of Payne’s who offers him a lucrative bodyguard job in Brazil. Since the opening of the game is set in Brazil, I asked if this was a flashback. “Something like that,” said the Rockstar rep.
Next we headed down to São Paulo, where Payne was charged with protecting a woman named Giovanna. In order to avoid menacing squads of gang members, Payne had to shoot his way through a series of broken-down warehouses and streets, frequently entering bullet time in order to take down multiple enemies at once. Enemies ganged up to take down both Payne and Giovanna, which would have made things exceptionally difficult if not for the ex-cop’s trusty bullet-slowing skills. Near the end of the demo, Payne hijacked a bus and forced Giovanna to drive as he stood in the passenger door, shooting enemies in slow motion along the way. Enemies die in occasionally hilarious ways thanks to the Euphoria engine, and it was fun to watch them flail their arms and fall to the ground in slow motion, screaming in agony. 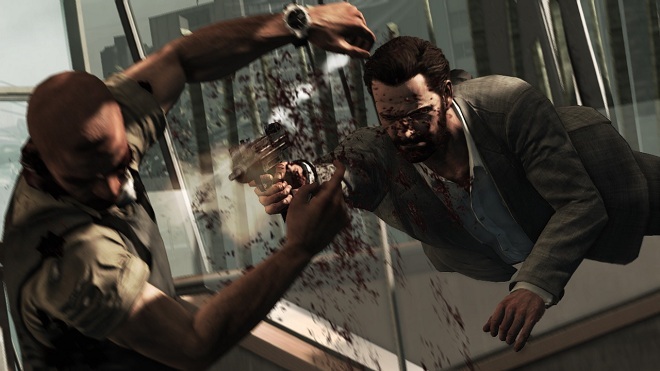 Storyline scenes are also a huge part of Max Payne 3 . Each level is sprinkled with cinematic interruptions, though Rockstar has put effort into making them feel seamlessly integrated. Don’t expect any loading times or pre-rendered graphics. Rather, you’ll zip in and out of various conversations and bits of action as you progress through every stage. There’s also a neat dynamic camera that occasionally zooms in on the bullet of your kill shots. You can move around the angles of this camera and even slow it down as you watch the bullet ram through an enemy’s throat. It’s a gory treat. After the demo was finished, I asked the Rockstar representative what Max Payne 3 ’s multiplayer mode would be like. “We’re not ready to discuss that yet,” he said. I asked if it’d be online, local or both. I asked if multiplayer would be integrated into the single-player campaign. When Rockstar is ready to discuss it, we’ll be sure to let you know.